The Card Weaving Premium Collection has everything you need to learn how to card weave, including hole-punched cards. All you need is some yarn and the desire to learn this fun way of weaving! Learn a new weaving skill with the Card Weaving Premium Collection! Are you wanting to try a new form of weaving? Do you need a simple weaving project for those busy summer months? Or do you want something small to weave between other projects? 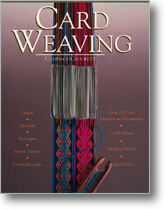 The Card Weaving Premium Collection has everything you need to learn how to card weave, including hole-punched cards. All you need is some yarn and the desire to learn this fun way of weaving! But hurry because stock is limited! 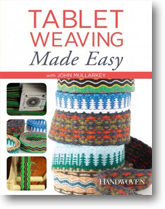 Included in this collection is the Card Weaving book, Tablet Weaving Made Easy DVD, Double-Faced Tablet Weaving DVD, and 50 Card Weaving Cards. Using the age-old art of tablet weaving (or card weaving), you can create beautifully patterned bands to use as belts, straps, bookmarks, or to embellish other weaving projects. Imagine a 4-shaft loom you can carry in your pocket! With double-faced tablet weaving, you can create reversible bands patterned with geometric patterns, figures, or letters, perfect for use as belts, straps, bookmarks, or to embellish other weaving projects. Card Weaving is the go-to resource for the weaver looking to learn a new technique. 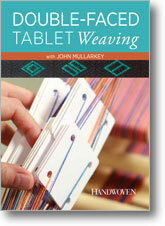 Whether you’re just getting started weaving and have limited room and resources, or you’re an experienced weaver looking for a new technique to add to your skill set, this title has something for everyone. Order your Card Weaving Premium Collection today!